Los Angeles, CA, April 16, 2019 – OTAQUEST LIVE, a unique live summer concert event featuring a dynamic slate of J-Pop, dance and hip hop superstars who have helped to define the vibrant sound, styles, moves and images that drive Japanese pop culture, will headline The Novo in L.A. Live in Los Angeles, CA on Wednesday, July 3rd. 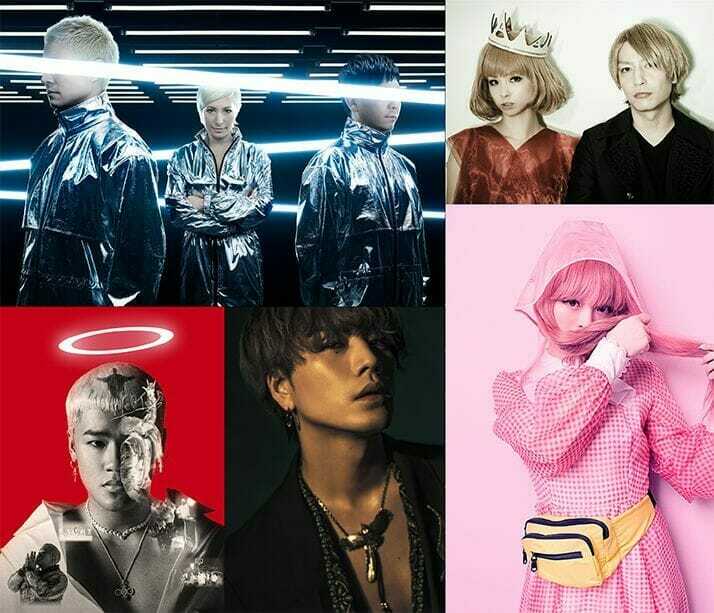 Produced by OTAQUEST and LDH USA, this one-night-only live concert will feature live concert performances by J-Pop superstars Kyary Pamyu Pamyu, and m-flo, as well as the first North American live performances from CAPSULE, CrazyBoy, and Hiroomi Tosaka. Later in the evening, OTAQUEST KICK OFF takes over and will showcase performances by some the hottest DJs from the bustling Tokyo EDM scene. Catch groove inducing sets by Taku Takahashi, TeddyLoid and Yasutaka Nakata (CAPSULE) and experience the captivating culture of the real Japanese club scene in Los Angeles for one night at this special live dance and DJ event. OTAQUEST events showcase what is “of-the-moment” in Japanese culture and celebrates the best in Japanese pop music and dance with some of today’s hottest artists. For additional information, visit: https://live.otaquest.com. m-flo is a hip hop and dance group that has taken the Japanese music scene by storm and is captivating a widening international fanbase. Beginning with their 1988 breakout debut, the maxi-single titled, the tripod EP, which earned them an instant spot in the Top 10 of the Japanese Oricon charts, m-flo has gone on to chart 12 singles and 2 hit full-length albums, including Expo Expo, which sold over 800,000 copies in Japan. In 2017, m-flo celebrated its 20th anniversary and continues to inject vibrant sounds and moves into hip hop and pop music. Kyary Pamyu Pamyu is the most followed Japanese artist on Twitter and one of Japan’s most influential pop icons. She made her major J-Pop music debut with the Moshi Moshi Harajuku EP, which was notably produced by Yasutaka Nakata (CAPSULE). Kyary released her full-length solo debut Pamyu Pamyu Revolution in 2015 and it scored her first #1 spot on the Oricon charts, iTunes Japan charts and Worldwide Electro charts. Kyary has garnered accolades from Western artists such as Katy Perry, Ariana Grande and Charli XCX. Kyary also curated an exhibition, The World Goes Pop, for London’s Tate Modern Art Museum. Kyary’s style and originality as a Harajuku icon and her music and artistic activities continue to attract and inspire an international fanbase. CAPSULE is the live production unit of Yasutaka Nakata. Formed with Toshiko Koshijima in 1997, they debuted in 2001 as a dynamic all-in-one music group combining shared passions for music, fashion, and video media. Yasutaka Nakata writes, composes, and arranges all of CAPSULE’s music. CAPSULE has performed at many renowned international festivals and incorporates impressive audio/video stage elements to its live shows. CAPSULE also has produced music for Perfume, Kyary Pamyu Pamyu, and contributed to the Star Trek: Into Darkness, Liar Game and Apple Seed Alpha movie soundtracks. CrazyBoy is the hip-hop project of ELLY, who made his debut as part of the J Soul Brothers III. His EPs NEOTOKYO and NEOTOKYO II have drawn wide international acclaim and debuted at #1 across multiple sales charts including on iTunes and mu-mo. CrazyBoy has collaborated with hip-hop legends Snoop Dogg and PKCZ® (VERBAL / DJ MAKIDAI / DJ DARUMA) on the track, “Bow Down ft. CrazyBoy from EXILE TRIBE.” The song was released by the Dutch dance music label, Spinnin’ Records/Trap City. CrazyBoy has also appeared on tracks by Shinichi Osawa, the hip-hop icon, ANARCHY, and the dance hall reggae masters, Mighty Crown. Hiroomi Tosaka is an actor, solo artist, and vocalist and released his major label debut in the Japanese pop group J Soul Brothers III from EXILE TRIBE with their first single, “Best Friend’s Girl”. In 2017 he released his first solo single, WASTED LOVE and last year debuted his first full-length album, FULL MOON, which he supported with a 23-date international tour. His clothing brand, CLAIR DE LUNE, offers a distinct world view expressed through fashion and draws influences from a wide range of cultures. As an actor, Hiroomi Tosaka debuted in Hot Road (2014), directed by Miki Takahiro, and was bestowed the Newcomer Award in four Japanese film festival ceremonies including the Japan Academy Prize. He is also an accomplished photographer and has released a collection of photo essays, NOBODY KNOWS. OTAQUEST started as a web media platform delivering news on Japanese pop-culture including anime, music, video games, fashion and fan culture. Headquartered in Japan and staffed with a global network of contributors, OTAQUEST delivers timely content and daily updates including interviews with content notable creators, directors, and industry luminaries, as well as editorial and video content highlighting unique and focused topics for a growing English-speaking fanbase. LDH USA Inc. was established to broaden, celebrate and raise awareness about Japanese culture internationally. The LDH roster of artists includes EXILE, J Soul Brothers III, GENERATIONS, and legendary Japanese hip hop and dance act, m-flo. A dynamic multi-faceted company, LDH Japan operates 14 dance schools and artist development facilities known as EXPG designed to inspire youth and develop talent. EXPG NY was established in New York City in 2014 and serves as an artist development center focused on training young artists in dance, music and singing and acting. In January 2019, EXPG LA was established in Hollywood in partnership with mL studio (Movement Lifestyle) one of the top dance studios in LA.